A series of highly ordered mesoporous ethane-bridged organosilica composite materials functionalized by carboxyethyltin group, SnR–Si(Et)Si–X (SnR and Si(Et)Si denote [Sn(CH2)2COOH]3+ and ethane-bridged organosilica groups, respectively), were successfully designed through one-step co-condensation–hydrothermal method. The pore morphology and textural properties, Sn(IV) coordination environment, the type of acid site, Brönsted and Lewis acid strength were systematically characterized by LXRD, TEM observation, N2 porosimetry measurements, MAS NMR (29Si, 13C, 119Sn), UV–Vis diffuse reflectance spectrum, as well as 1H and 31P MAS NMR, FT-IR analysis of adsorbed pyridine, acid–base titration. 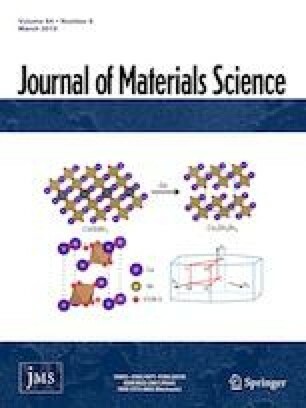 Composite materials SnR–Si(Et)Si–X possess Brönsted and Lewis acid sites, which originates from –COOH in [Sn(CH2)2COOH]3+ group and bridging OH in [Si(OH)SnR] group as well as tetrahedral coordination framework Sn(IV) in the open configuration [SnR(SiO)3(OH)], respectively. The above 2D hexagonal mesoporous structure with unique textural properties, double acid sites (Brönsted and Lewis acid sites) and hydrophobic surface make SnR–Si(Et)Si–X exhibit excellent acid catalytic activity, reusability and water tolerance toward ketalization of cyclohexanone with glycol in absence of azeotrope agent at low temperature. The online version of this article ( https://doi.org/10.1007/s10853-018-03207-8) contains supplementary material, which is available to authorized users. This work was supported by the Natural Science Foundation of China (21503103, 21671091).